If one is able to establish a monastery at the sacred place of Hayagriva (Tamdrin), Dragmar, it will be of great benefit to all beings. Sala Rigzin Gyatso, who was also known as the Vidyadhara Sagara, visited Samar and had an auspicious vision of a red dear sleeping in the middle of a wall made of its dung. The master approached the deer and it stood up and vanished. Based on this vision he foresaw this as an auspicious place and built the new monastery. Sala Rigzin Gyatso then became the first throneholder attaining enlightenment in one lifetime. He left many disciples capable of preserving the lineage like Pema Dorje Thogme Tsal, the second throneholder. All of these throneholders have practiced the distinct Nyingma teachings of the Do-Gyu-Sems and thus preserved the doctrine of the Three Great Transmissions. As a result they attained the status of scholar and siddha in one lifetime. Though their biographies can be found in the scriptures, due to the destruction of many rare and precious texts during the Cultural Revolution in Tibet, they are very difficult to find. Dragmar Wangchen Monastery itself faced the danger of extinction during that time period, but Lama Choephel, Chogtrul Tenzin Thinley, and Mayum Pema Wangmo have jointly renovated it. Today's Dragmar Rinpoche continues to help renovate and improve the monastery. The First Dragmar Rinpoche, Kunzang Kyabdal Lhundrub was the famous disciple of Gaje Choekyong Dorje, Rigzin Kunzang Sherab and many other great masters. He revealed profound treasure teachings from beneath the pillars of Samye Monastery. When he passed away he dissolved his body into the heart of the statue of Nubchen Sangye Yeshe. The Second Dragmar Rinpoche, Khyabdag Pawo Dorje was an emanation of the first Dragmar Rinpoche. He was the principal disciple of Kunzang Thinley Namgyal, the fourth throneholder of the monastery. He was known for his ability to summon the dharma protector Zhingkyong and for bringing many scriptures, tsakli, thangkas, mandalas, and profound treasure teachings, and tantras to the monastery. The Third Dragmar Rinpoche, Yizhin Wangyi Gyalpo, was known as a wise, pure and noble-minded scholar. He persevered in the two stages of meditation as a result of which he attained high realization. He was free from the stains of the eight worldly concerns and always lead beings on the path of dharma. The Fourth Dragmar Rinpoche, Dragmar Pema Gyaltsen, received empowerments, oral transmissions and instructions from great masters such as Terton Lerab Lingpa, the Third Kathok Situ Ogyen Choekyi Gyatso, Palyul Karma Thegchog Nyingpo, and so on. Many miracles were witnessed during his time. For instance, during a Drubchö based on Gongdu, a massive rainbow tent and sweet-scented flowers blossoming throughout the entire monastery premises appeared. He made many wood blocks of the Gongdu texts and other rare and precious texts. The Fifth Dragmar Rinpoche, Pema Wangchen or Khanyam Dojre Rolpa Tsal, was recognized by the Fifth Dzogchen Rinpoche. He established a Shedra at Dragmar Monastery and, because of his close relationship with the masters of Kathok and Palyul, he received many empowerments, oral transmissions and instructions from the Nyingma Kama and Terma teachings. Because of bad times, he did not live long to complete all of his activities. The Sixth Dragmar Rinpoche, the thirtheenth and present throneholder, Pema Wangdrag, was born to Mr. Kharsar Gyurme and Mrs. Rinchen Tso in 1975, during the Wood Hare Tibetan Royal Year of the 17th Rabjung Cycle in North India. His Holiness Dudjom Rinpoche and His Holiness Pema Norbu Rinpoche recognized him as the authentic incarnation of the fifth Dragmar Tulku when he was in enrolled in Tibetan primary school at the age of six. He was given the name of Pema Jigme Wangdag Thubtob Gonpo, thus recognizing him to be an heir Guru Padmasambhava. When he reached the age of nine, he went to Namdroling Monastery. 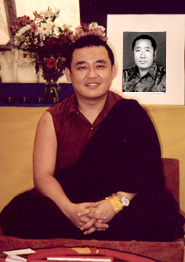 There he relied upon His Holiness Penor Rinpoche as his teacher. His Holiness looked after him with great care and affection and, at the age of ten, formally enthroned him with great grandeur. Under His Holiness Penor Rinpoche's guidance, he received the basic education. At fourteen he received the novice vow from His Holiness and the name Thupten Dongag Mawei Senge. He then enrolled in the Ngyagyur Nyingma Institute, the prestigious religious college of Namdroling monastery. For nine years he studied under many excellent teachers. He studied the sutra and tantra teachings as well as common traditional studies like Tibetan Language, poetry, political history and religious history of Tibet. Thus he filled his mind with treasures of the scriptural knowledge and also the Buddhist practice. Especially he has studied the writings of Longchenpa, Rongzom, and Mipham in great detail, thus becoming an Illuminator of the Nyingma Doctrine and earning appreciation from many eminent scholars of the institute. At twenty-four he received full ordination from His Holiness Penor Rinpoche. His Holiness always showered him with love and affection and considered him as a heart son. Keeping in view of his vast and profound scriptural knowledge, he was appointed as a kyorpon (revision teacher) at the Ngagyur Nyingma Institute, and subsequently became a lopon (acharya). He has also received many teachings such as the full Ngondro, Tsa Lung and Dzogchen according to the Nam Chö cycle, Rinchen Terzod, Nyingthig Yabshi, Kama, Gongdu, Nam Cho, Ratna Lingpa's treasure teachings, Kalachakra, Mayajbal, Dupa Do, and so on. He has received teachings from His Holiness Drodrupchen Rinpoche and His Holiness Taklug Tsetrul Rinpoche as well as many other great masters of the Nyingma lineage. He has traveled abroad with His Holiness Penor Rinpoche and was praised for his clear and detailed instructions of Tsalung and other esoteric practices to Dharma students. At present he is working as a teacher in Ngyagyur Nyingma Institute and also taking responsibility to renovate and improve the condition of Dragmar Wangchen Monastery in Tibet.